I saw that photo over at Side Dish Magazine in a post mentioning the Blue Ribbon Bacon Festival in Des Moines. Did someone say “bacon eating contest”? Why yes, I believe they did. It’s been a while since my last bacon post and … Oh, who am I kidding, there’s no reason for this except that I found some more great bacon pictures. And it’s Friday. So here’s another entry in the “women in bacon” theme. Last year for Halloween, I was bacon. If you’ve never been bacon before, I highly recommend it. Everybody, you see, loves bacon. It is, as my friend Monica says, the Candy of the Meats. People do not want to be quiet about their love for bacon, they want to declare it, often loudly. Even the most shy people at least muttered “bacon!” under their breath as they passed me. I have never been so popular, so adored (and strangely, so hit-on) in my life. I’ll be needing this link in about six months. 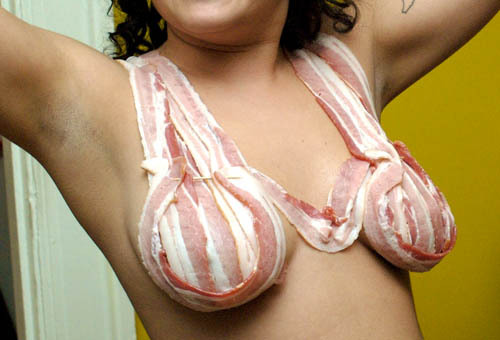 And to show that men can wear bacon too, there’s this. There’s a theory that everything is better with bacon. We believe that theory with all of our heart. To that end, we are introducing our line of bacon formal wear with Uncle Oinker’s Bacon Scented Bacon Print Tuxedo. You can get married in bacon, get confirmed in bacon or go to the Oscars in bacon! Wait until Joan Rivers gets a whiff of you. Each Tuxedo is tailored from chemically treated latex print fabric in one of four different sizes. Best of all, it smells just like bacon sizzling in the pan. Dry clean only. This one I won’t be needing the link for next year. Or the year after that. Or ever.